Friday, July 10, 2015, 7:30 p.m.
Saturday, July 11, 2015, 7:30 p.m.
Sunday, July 12, 2015, 2:30 p.m.
RiverStage’s 2014-15 season will conclude with the 2005 musical The 25th Annual Putnam County Spelling Bee by Rachel Sheinkin, with music and lyrics by William Finn, which Bee tells the story of six eccentric students competing in a spelling bee at the fictional Putnam Valley Middle School. Supported by three equally unusual adults who are trying to keep the competition running smoothly, the characters sing, dance, and stop to tell hilarious and touching stories from their complicated lives as young “overachievers.” An unusual aspect of the show is that 4 real audience members are invited on stage for each show to compete in the spelling bee alongside the characters. Featuring catchy tunes like “My Friend the Dictionary,” “I’m Not That Smart,” “I Speak Six Languages,” and “The I Love You Song,” Spelling Bee was nominated for six Tony awards on Broadway and won the 2005 Tony and Drama Desk Awards for Best Book. 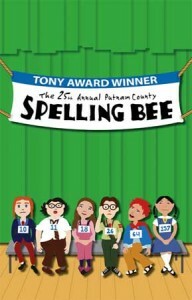 This production of The 25th Annual Putnam County Spelling Bee features an all-star cast of 9 actors and singers who have appeared in productions with RiverStage, Gaspipe Theatre Company, Knoebels Amusement Park, Kutztown University, Bloomsburg University, Shippensburg Univerisity, and high schools including Lewisburg and Milton. Bryanna Kifolo of Lewisburg, who appeared in as Tessie in RiverStage’s Gypsy last summer, will play the young Olive Ostrovsky, while Steve Aguirre (RiverStage’s Musical Comedy Murders, Courtyard Theatre’s Rent) plays the awkward but lovable William Barfee. Brandy Vasey, who also appeared in Musical Comedy Murders and was the 2013 winner of Valley’s Got Talent, plays the youngest student, Loggaine Schwarzandgrubienniere, and Caroline Pogust (RiverStage’s Picasso at the Lapin Agile, Musical Comedy Murders) plays the new transfer student Marcy Park. Camden Choplick, who recently starred in Milton Area High School’s production of Mary Poppins (as Bert) plays the returning champion Chip Tolentino, and Tim Hippensteel (Gypsy, Joseph and The Amazing Technicolor Dreamcoat) plays the underdog student Leaf Coneybear. The cast is rounded out by a trio of adults, Marina Gresh of Danville and Jason Puckey of Watsontown (who both starred in last summer’s Gypsy), and Matthew Fulkerson of Lewisburg (playing the ‘comfort counselor’ Mitch Mahoney).